Sue Spengler has lived in the neighborhood just east of Cheyenne Canyon for three years. She's an avid hiker and loves to explore the nearby trails, but it wasn't until last summer that she first stumbled across the quiet little hiking area known as Strawberry Hill, or Strawberry Fields. "I discovered it like a lot of people do, sort of accidentally," Spengler explains, "walking up South Cheyenne Canyon area going, 'Hmm... I wonder where this trail leads.'" Following the unmarked social trails through the woods south of the entrance to Cheyenne Canyon, she eventually found herself in a lush meadow. "I came out of the little stand of trees into this meadow and the grass was probably 3 or 4 feet high and I felt like I had walked into little Austria or little Switzerland or something and I felt like doing a little Julie Andrews 360 up in the hills," says Spengler. Since she first discovered it, Spengler says she's taken to hiking Strawberry Hill a few times a month. She likes that it's a little quieter and less developed than other places the area. But she worries that that's all about to change. This meadow is part of a roughly 190-acre parcel that the Broadmoor would receive from the city in the proposed land exchange. The hotel hopes to build a private "boutique" riding stable and picnic pavilion for its guests on a 7-9 acre section of the property. The meadow is the most likely location. Spengler, for one, opposes the plan. She believes that the proposed development will "change the very nature of the experience" in the park. And she's not alone. To date, more than 3200 people have signed a petition opposing the exchange. The forest at Strawberry Hill. 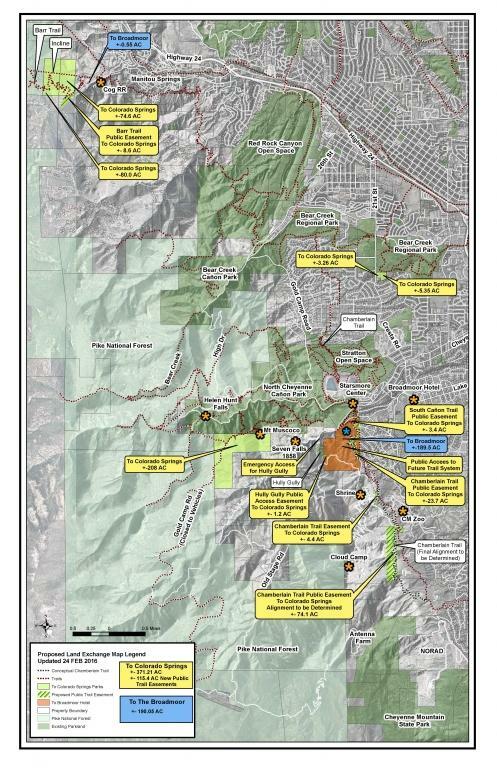 On the rest of the 190 acres—most of which is steep and forested—the Broadmoor plans to develop trails that would be open and accessible to the public. For some proponents of the deal, this is a major selling point. At a recent community meeting hosted by City Councilman Keith King, Colorado Springs resident Lee Wolf detailed his frustration with the way that the city has managed Strawberry Hill. "I'm here to point out the obvious fact that the city doesn't have any money to take care of parks," Wolf explained. Wolf argued in support of the deal, saying that he thinks "the Broadmoor will do a better job of taking care of... Strawberry Hill Fields." Director of the Colorado Springs Parks Department, Karen Palus, doesn't disagree. "I think our team does a phenomenal job," she says. "Are they spending their time and their resources in the more populated, more used area? Most definitely." Palus also sees the deal as an opportunity to achieve some of the goals set out in the Parks Department’s recent Master Plan. According to Palus, in the deal, the public will retain access to all but 7-9 acres of the Strawberry Hill area, while also gaining, "key connections throughout our overall trail system." A map of the properties included in the proposed swap. If the deal goes through, the city would receive 370 acres in exchange for Strawberry Hill. 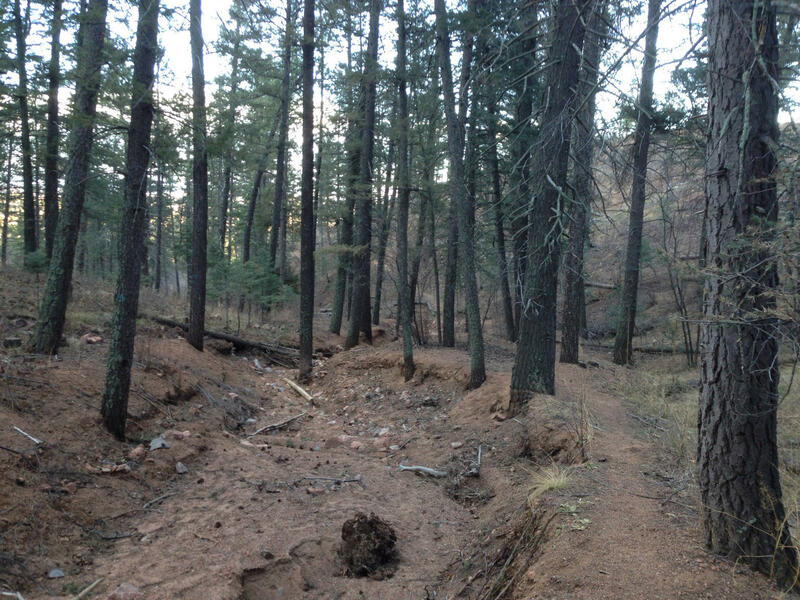 This would include parts of the Barr Trail and Manitou Incline that the city is already responsible for maintaining. The deal would also provide easements for the Chamberlain Trail—a proposed trail running from Garden of the Gods to Cheyenne Mountain State park which has been in the works for decades. For Susan Davies, head of the Trails and Open Space Coalition, the exchange is a pragmatic way to advance the agenda of a Parks Department with limited resources. "We’re underfunded," says Davies, "so I think wherever we can find opportunities to make our dollars go further or to enter sometimes into a private-public partnership that serves the community and serves the system, I think we're very short-sighted if we don’t take a hard look at it." 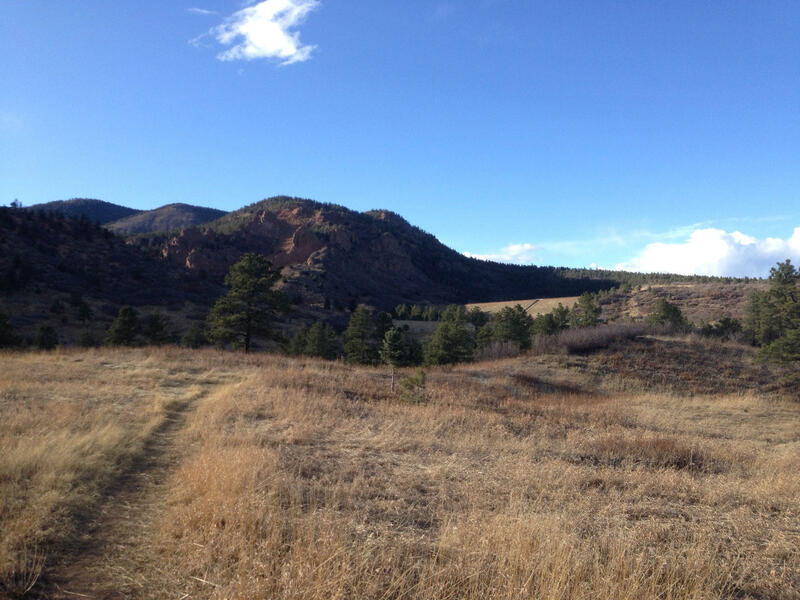 The Trails and Open Space Coalition supports the deal, provided that the Broadmoor guarantees public access to Strawberry Hill and agrees to a perpetual conservation easement on the property. So far, the Broadmoor has accepted these conditions. 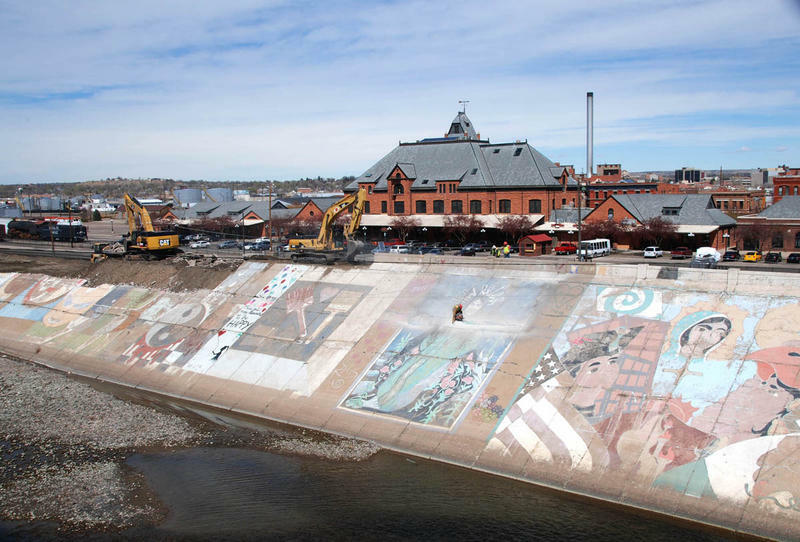 But for many critics of the deal, no amount of concessions from the Broadmoor would be enough to convince them to give up this piece of public land. For Sue Spengler, it's a matter of principle. "It's a philosophical question about inclusion vs exclusion," explains Spengler. "It goes deeper than conservation easements and deeds and trusts and land, it comes down to what kind of experience do you want the public to be able to have, and our tourists… our tourists who are not staying at the Broadmoor." 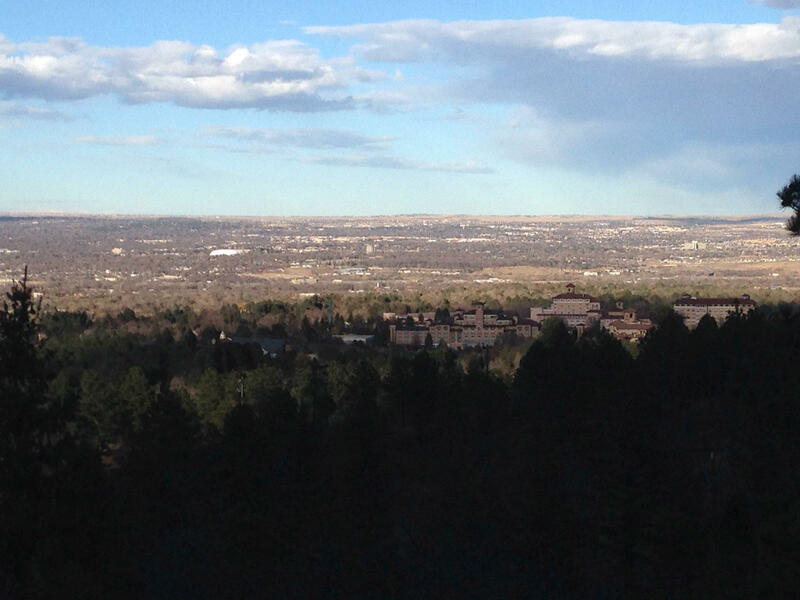 A view of the Broadmoor looking southeast from a ridge above the meadow at Strawberry Hill. Spengler and many others have suggested that the city put the issue to a vote. They have also asked that the city look into buying the land that it hopes to acquire using money from the voter approved TOPS fund. Parks Director Karen Palus says, so far, neither of these suggestions have proven feasible for the city, but adds that the parks department has been working hard to incorporate citizen feedback into the plan. 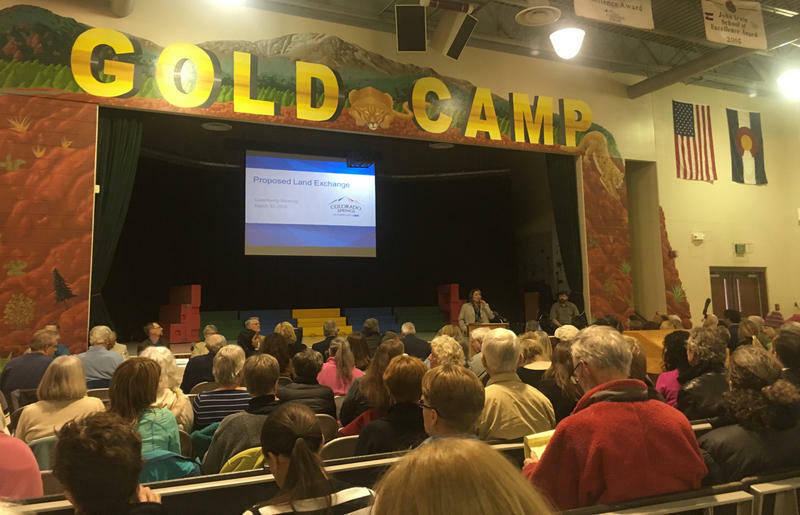 The next public meeting on the land exchange will take place Wednesday, March 30th, from 6-8pm at Gold Camp Elementary School. At this meeting, the city plans to present the appraisals of the the properties included in the deal, and the Broadmoor will provide new details on its building plans for the 7-9 acre stable and pavilion area at Strawberry Hill. A final City Council vote on the proposal is expected later this spring. In the meantime, the Parks Department is encouraging the public to submit comments about the deal on a website devoted to the deal. A bill that would allow people to collect rain that falls from their rooftops remains hung up in the Senate Agriculture and Natural Resources Committee after the chair said he wasn't comfortable with the measure. It's not clear when the committee will vote on it. 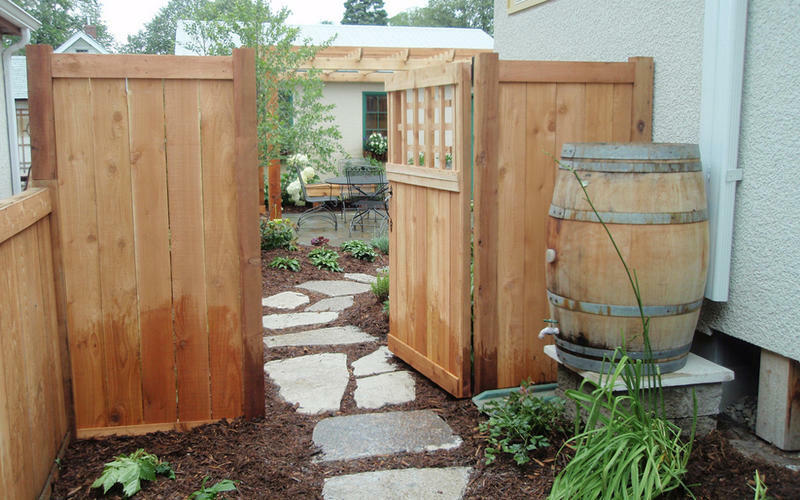 The same thing happened last year when the rain barrel bill vote was delayed. And while the bill eventually cleared the Senate Agriculture Committee over the objections of the Republican chair, it failed on the final day of the 2015 legislative session when time ran out.